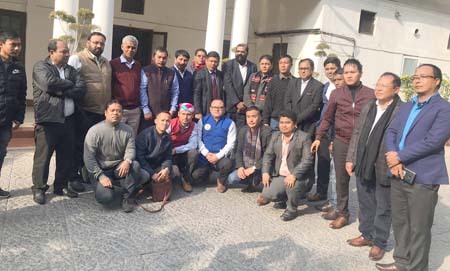 NEW DELHI, Feb 3: Major political parties and student groups of the Northeast on Sunday intensified their campaign against the citizenship amendment bill (CAB) in the national capital with a series of meetings with leaders of the BJP, the Congress and other parties, urging them not to pass it in the Rajya Sabha. A delegation of 11 political parties of the Northeast, including the Asom Gana Parishad (AGP) and the National People’s Party, met Union Home Minister Rajnath Singh and requested him not to press for passing the bill in the Rajya Sabha, AGP leader and former union minister Birendra Prasad Baishya told PTI. The delegation was led by Meghalaya Chief Minister Conrad Sangma. Earlier in the day, former Assam chief minister and founder-president of the AGP, Prafulla Kumar Mahanta, along with other party leaders met Leader of Opposition in Rajya Sabha, Ghulam Nabi Azad, union minister Ram Vilas Paswan, and Samajwadi Party leaders, urging them to take a stand against the bill. The leaders of the regional parties of the Northeast, who are camping in Delhi, will meet representatives of all political parties, so that the bill is not passed in the upper house, Baishya said. A team of top leaders of the North East Students’ Organisation (NESO), comprising major students’ groups of the region, met Biju Janata Dal leader Bhartruhari Mahtab and requested him to ensure that his party votes against the bill if it is brought in the upper house. NESO advisor Samujjal Bhattacharjya told PTI that they met the leadership of the JD-U, which already declared its opposition to the CAB, and would meet leaders of the Congress, the Shiv Sena, the Akali Dal and some others parties in the next two days. The legislation was passed by the Lok Sabha during the winter session on 8 January, and has been awaiting the Rajya Sabha’s nod. The political parties have been protesting on the grounds that the bill seeks to grant nationality to non-Muslims who have come up to 31 December, 2014, thereby, increasing the deadline from 1971 as per the Assam Accord. Addressing the joint sitting of parliament, President Ram Nath Kovind on Thursday said the bill would give justice to persecuted minorities of Pakistan, Bangladesh and Afghanistan through Indian nationality. Prime Minister Narendra Modi had also announced that the bill was an “atonement of the wrong that was done during India’s Partition. India will safeguard all who had been victims of the Partition,” he had said. 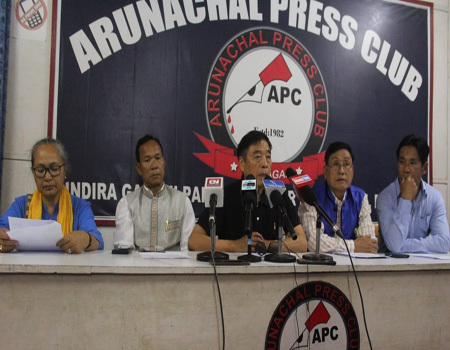 The delegation of the All Arunachal Pradesh Students’ Union (AAPSU) is also camping in the national capital, meeting different political parties to drum up support against the CAB. In the first leg of their tour, the delegation met different regional political parties of the Northeast, led by Meghalaya Chief Minister Conrad Sangma (of the NPP), Atul Bora (AGP), and Tribal Welfare & Forests Minister of Tripura, MK Jamatia (Indigenous People’s Front of Tripura), at the residence of the Meghalaya chief minister here on Sunday. “Earlier in the day, the NESO team also called on political strategist and vice president of the Janata Dal (U), Prashant Kishor. 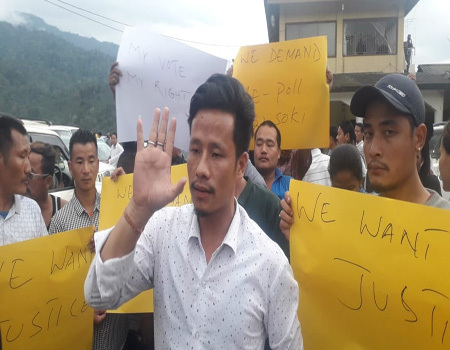 He assured the union members that his party would vote against the bill if it is tabled in the Rajya Sabha,” AAPSU general secretary Tobom Dai informed. The delegation also called on Biju Janata Dal parliamentarian Bhartruhari Mahtab, who was also a member of the JHPC on CAB, to garner his support against the bill. “The BJD leader was also sympathetic to the cause of indigenous people of the Northeast and assured his party’s support,” Dai informed. He said the delegation is upbeat, and expressed delight over the positive response from different political parties on the contentious CAB. “Though many of them do not come from the Northeast, the leaders have gauged and understood the precarious situation the bill will cause if pushed on the indigenous people of the Northeast, whereas many of our own state leaders are in denial mode or are dictated by their high command on the issue,” Dai said. He also informed that the AAPSU and other component organizations of the NESO are slated to meet Shiv Sena leader and MP Sanjay Raut on the CAB on Sunday night. The AAPSU delegation includes NESO organising secretary Marge Riba, AAPSU vice president Meje Taku, and AAPSU assistant finance secretary Kabak Himalaya. The 83-year-old director, known for Manipuri films such as Olangthagee Wangmadasu, Imagi Ningthem and Ishanou, was bestowed with the country’s fourth highest civilian honour in 2006. “The bill is against the interest of the Northeast and its people, especially in Manipur. All the leaders of the states in the Northeast have already requested the central government to reconsider (the bill’s passage). “But yesterday when I was following the news, our honourable prime minister announced that the bill would be passed soon. He also requested the chief minister of West Bengal to help him pass the bill. That means the government, rather the BJP, is determined to pass this bill. They are not listening to us,” Sharma told PTI. “I’m not a politician. I’m not at all concerned with politics. I’m just a filmmaker. I have seen a lot in life. But this is the worst. If the bill passes, there will be no place for us. This is against the Northeast.